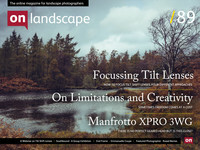 When I was asked by On Landscape's editor Tim Parkin to write an "End Frame" article for the magazine he said the hard part would be selecting the image. The image had to be my favourite photo from another photographer. I knew immediately which image I was drawn to so that part was easy, however to put into words as to the "why" of it all has eluded me a bit. It was just an immediate visceral response, wow.